Sepsis is the severe, life-threatening end of infection, and arises when the body’s response to infection injures its own tissues and organs. Without early identification and treatment there is a significant risk of long-term disability or death. Sepsis doesn’t have a gold standard diagnostic test and there is no single, stable sepsis definition meaning its frequency and deaths cannot be measured or compared over time, but only roughly estimated. This has been compounded by coding changes this year that led to an increase in reported sepsis numbers. This has highlighted the need for a proxy measure, and the only credible, reproducible and easily obtainable proxy measure is those admitted to hospital with infection- the Suspicion of Sepsis (SOS) category. 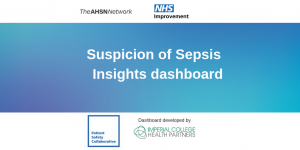 The Suspicion of Sepsis (SOS) Insights Dashboard tool for the first time ever enables organisations to see an overall picture of hospital admissions coded in the SOS category. The SOS Insight Dashboard is an example of what can be achieved through cross-system collaboration. The Dashboard has been created by Imperial College Health Partners (ICHP), through the Patient Safety Collaborative (PSC), with NHS Improvement’s Patient Safety Measurement Unit (PSMU) and NHS England all providing the unique breadth to bring partners together and spark cross-boundary critical conversations. Dr Matt Inada-Kim, National Clinical Advisor, and colleagues in Oxford, conceived the SOS category in 2017. ICHP led on the concept, development and building of the Dashboard trialling it with clinicians as well as international figures in sepsis Mervyn Singer (Professor of Intensive Care Medicine at University College London) and John Welch (President, International Society for Rapid Response Systems). The Dashboard for the first time enables organisations to see an overall picture of hospital admissions coded in the SOS category, allowing them to assess the scale at a local, regional, and national level. The Dashboard provides intelligence as to whether interventions and innovations in sepsis / infection care are improving outcomes for patients. It will also help to better plan and prepare local services potentially saving lives across the country. In Summer 2018 the Dashboard was proudly shortlisted for a HSJ award 2018 in ‘Enhancing Care by Sharing Data and Information’. The Dashboard shows the power and importance of the use of data in the right context. It is the exciting first step in gaining a clearer understanding of the scale of sepsis and will underpin the future of conversations about how to plan and prepare leading to better patient outcomes. The team are now holding a series of webinars to help build on this work and look ahead for 2019. Download our poster, published March 2019, evaluating the SOS dashboard.